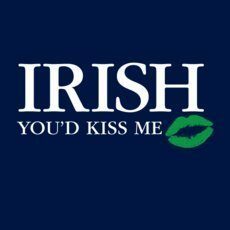 St. Patty's Day Irish You'd Kiss Me T-Shirt Only $7.99! You are here: Home / Great Deals / St. Patty’s Day Irish You’d Kiss Me T-Shirt Only $7.99! St. Patty’s Day Irish You’d Kiss Me T-Shirt Only $7.99! You know we absolutely love fun t-shirts and this St. Patty’s Day Irish You’d Kiss Me T-Shirt Only $.7.99 is perfect for wearing next month! Whether you wear it yourself or give it as a gift it is sure to put a smile on every face who reads it! Grab this and other hot t-shirts at Tanga starting at only $5.99 every day!